Address: 143 George Street, Hadleigh, Suffolk. 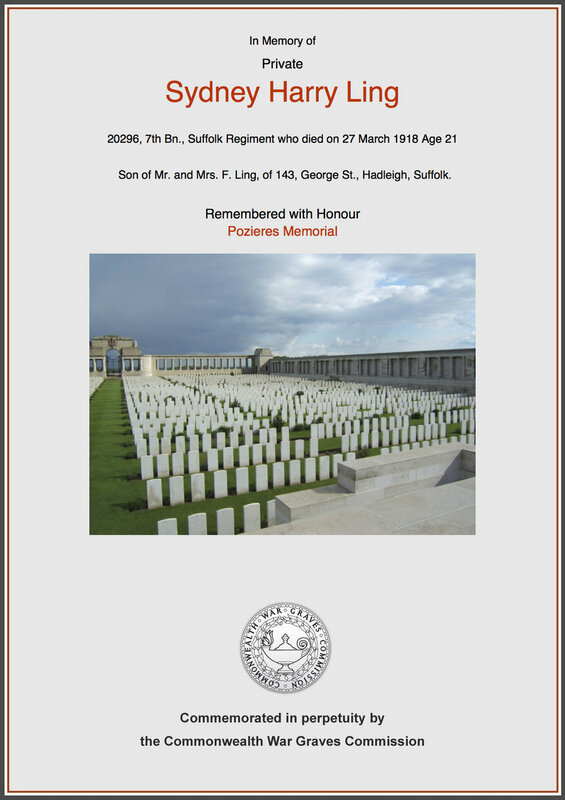 At the age of 18 in May 1915 Sydney enlisted with the Suffolk Regiment and on 22 December 1915 when only just 19 he was in France serving with the 8th Suffolks. In the spring of 1916 Sydney was probably constructing the defensive positions around Albert, close where he was to lose his life two years later. As far as is known he continued with the 8th Suffolks, through the 1916 battle of the Somme and the 1917 battles at Arras and Passchendaele and was with the battalion when they disbanded in February 1918. At that point Sydney was transferred to the 7th Suffolks. In March 1918 it was difficult to be optimistic regarding the outcome of the war. The 1917 Russian Revolution led to the collapse of the eastern front which meant that many more German troops were now available to fight on the western front. By this time the British had taken over responsibility for one hundred and twenty five miles of the western front running from Belgium south through Northern France. This included a twenty-eight miles section recently taken over from the French in January. At the same time the British War Cabinet had put restrictions on the number of soldiers available which meant that the Army had to reorganise. Some battalions were disbanded with the men being transferred to fill other units. Sydney was entitled to the above three medals; the 1915 Star, the British War medal and the Victory medal. Hadleigh men serving with the 8th Suffolks found themselves being sent to join the 2nd, 4th or 7th battalions. The result of this reorganisation meant that men found themselves in the front line for longer and with less rest. As March drew on, the Germans, reinforced with troops, wanted to launch a massive offensive before the American forces could be deployed. On 21 March 1918 at 04:40hrs the ‘Kaiserschlacht’, the Kaiser’s Battle began with an enormous barrage that was greater than anything seen previously in the war. On that one day an incredible three and a half million gas and high explosive shells were fired into the British lines. For the British there was no alternative but to retreat across the old hard fought for battlefields of the Somme. The 2nd Suffolks were a few miles south of Arras where the front line was pushed back about 8 miles pivoting around the town; Arras was never lost. The 7th Suffolks with no artillery support were close to the ruined town of Albert, with their backs to the wall, inadequately equipped and tasked with holding the bridge-heads and facing the rapidly approaching German advance, an advance that in a matter of a few days had pushed back the front line at its maximum for over 40 miles. The 7th Suffolks war diary states that the Albert Operations began at 10.30pm on 26 March with simultaneous attacks on their positions by road bombing and machine gun enfilading along the railway line to the west of the town. The fighting was at close quarters in the rubble strewn streets of the western half of Albert. The Battalion’s casualties were in excess of 260, many were known to be killed, but many were missing. 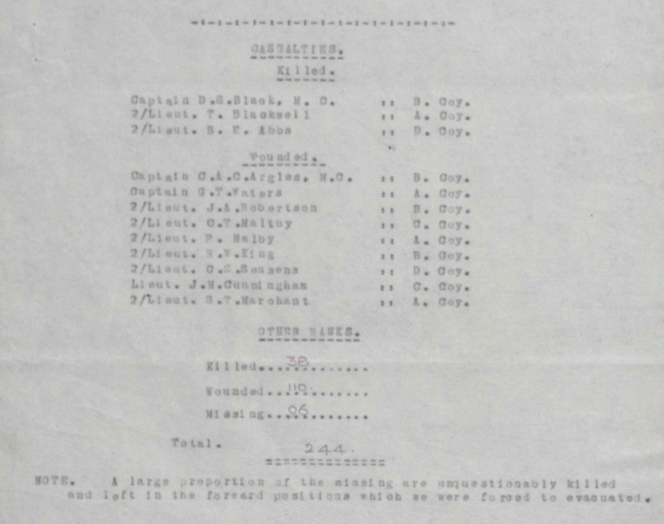 As the war diary says: “A large proportion of the missing are unquestionably killed and left in the forward positions which we were forced to evacuate.” For Battalion the operation ended on 28 March with a return to billets. Private Sydney Harry Ling was one of those to lose his life in this action. Sydney's mother Lottie had a brother serving with the 5th Battalion the Suffolk Regiment. He was sent to Gallipoli in 1915 were he was killed in action on 12 August. That was a black day for Hadleigh with 16 Hadleigh men being killed in the same battle. 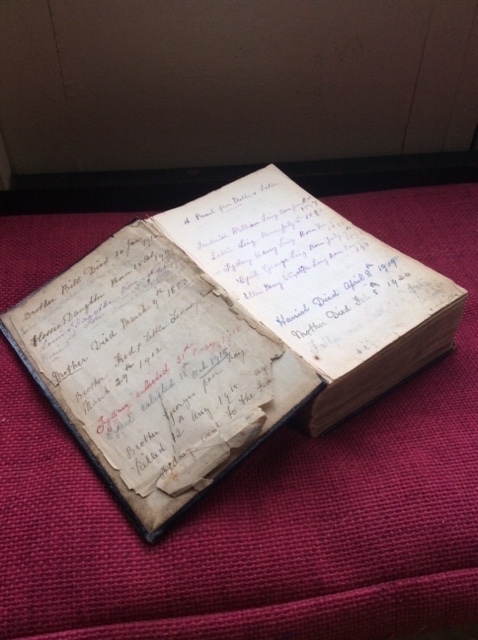 Lottie kept notes in her bible recording key events / dates for the family. The bible is still in the family today. 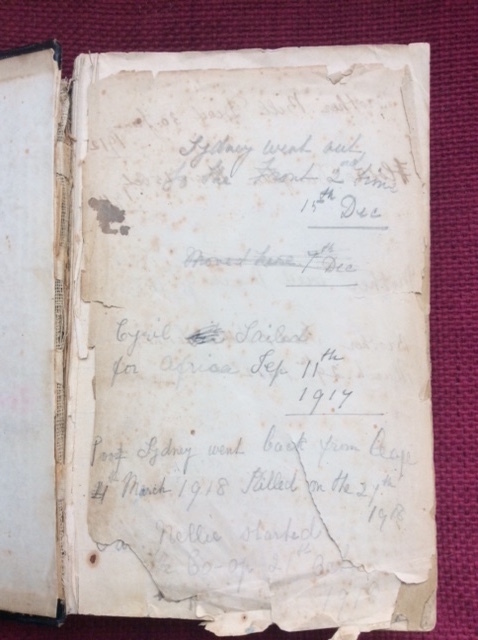 The red font on the page above states that "Sydney enlisted 31st May 1915". It then mentions Sydney's brother Cyril enlistment date. The next entry is simple, yet very sad. 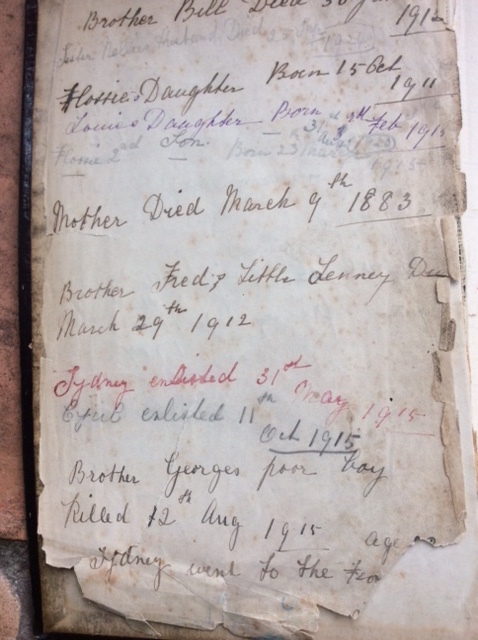 It states "Brother George poor boy killed 12th August 1915 age 32". George Revans' story is told elsewhere in this website. The entries on the next page (left) talk about both Sydney's and Cyril's movements. The last two entries are entry towards the bottom of the page refers to Sydney's death. It says "Poor Sydney went back from leave 21st March 1918 killed on the 27th 1918". Sydney's body was never found and he is remembered today on the Pozieres Memorial on the Somme battlefield and on the Hadleigh War Memorial. 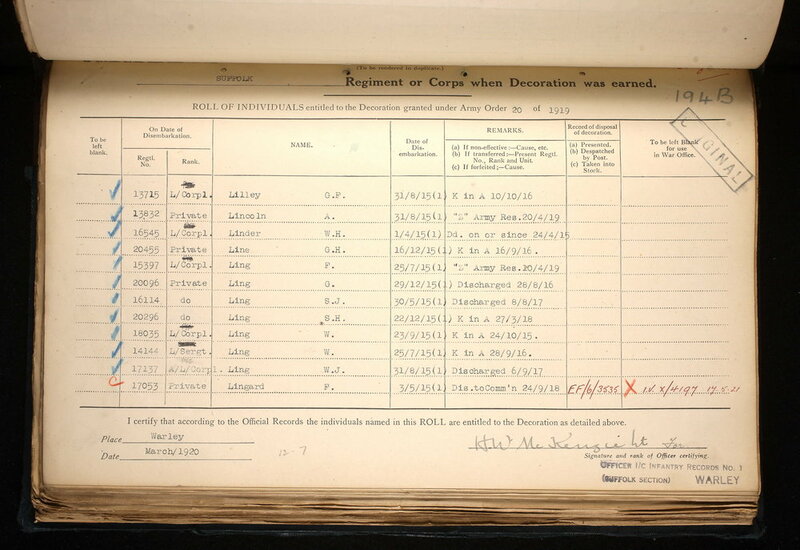 We hope that this page has been able to tell the story of Private Sydney Ling. If you know of any information which might help to add to the story then please get in touch.